The Sports Turf Managers Association (STMA) has announced that Ed Smith Stadium, the Spring Training home of the Baltimore Orioles in Sarasota, has won the Field of the Year Award for professional baseball. Dan Thomas, the head groundskeeper of Florida operations for the Orioles, was scheduled to accept the award this week at the 27th annual STMA Conference & Exhibition in San Diego, Calif., an Orioles news release says. STMA’s Field of the Year Award, “considered the highest honor in the industry,” is presented annually to various sporting grounds members at the professional, collegiate, schools, and parks and recreation levels, the release explains. This year, a panel of 15 judges rated sporting grounds based on playability, appearance of surfaces, utilization of innovative solutions, effective use of budget, and implementation of a comprehensive agronomic program, the release says. “STMA is a nonprofit organization for individuals who manage and maintain sports fields,” the release adds. Founded in 1981, the association has more than 2,600 members. 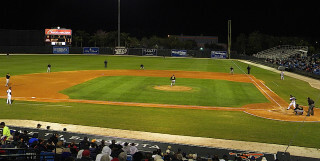 Ed Smith Stadium was built in 1989, but it underwent extensive renovations prior to the 2011 season, the release points out. “In the six years since the Orioles moved Major League Spring Training to Sarasota, more than 640,000 fans have enjoyed Orioles baseball at Ed Smith Stadium, helping to establish numerous club and Sarasota attendance records,” the release notes. “The ballpark also hosts special events and year-round OriolesREACH initiatives through the Sarasota 365 program, demonstrating that the club’s commitment to its southern home goes far beyond baseball,” the release adds. “This award is a source of great pride for the Orioles and the entire Sarasota community, as it recognizes Ed Smith Stadium among the best sports facilities in the country,” said David Rovine, vice president, Orioles-Sarasota, in the release. “We commend Dan and his staff for their tireless efforts to make our ballpark the crown jewel of Spring Training in Florida,” Rovine added.